of the activities surrounding the 2018 Super Bowl in Minneapolis. 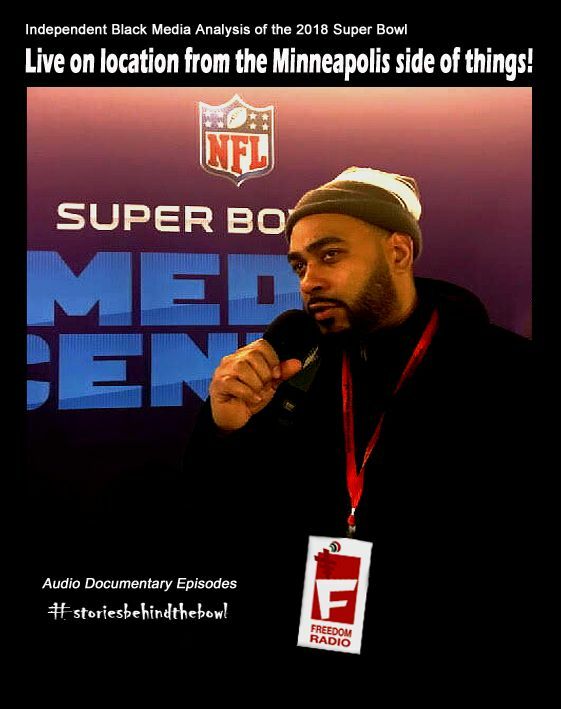 All audio episodes stand as unique original interviews with observations of Minneapolis community life, economics and basic questions of black community benefits including accessibility to Super Bowl committee sanctioned activities. How did black businesses and neighborhoods respond to the overwhelming international media spotlight? #StoriesBehindTheBowl also features an eye opening conversation with University of Minnesota department head and sports & race scholar Dr. Doug Hartmann which highlights Lavar Ball's cultural influence on and off the basketball court. Don't miss this incredible work captured in its entirety with on-the-scene reporting about happenings taking place around the city up to big game day. The project now available on freedomradioandtv.com was produced and directed by independent journalist Ralph L. Crowder III, (producer of "The Walk to School audio documentary), who said "It's imperative we tell our own stories and define any associated imagery." Plans are currently underway to produce #StoriesBehindTheBowl 2019 in Atlanta, Georgia. Query letters are now being accepted at: feedback@cynthcarm.com from those with interest to partner. Deadline: March 31, 2018.